These are quick snack ideas that you can make for kids or adults. Its amazing how vegetables I hated as a child are now my very favorite things to experiment and eat. 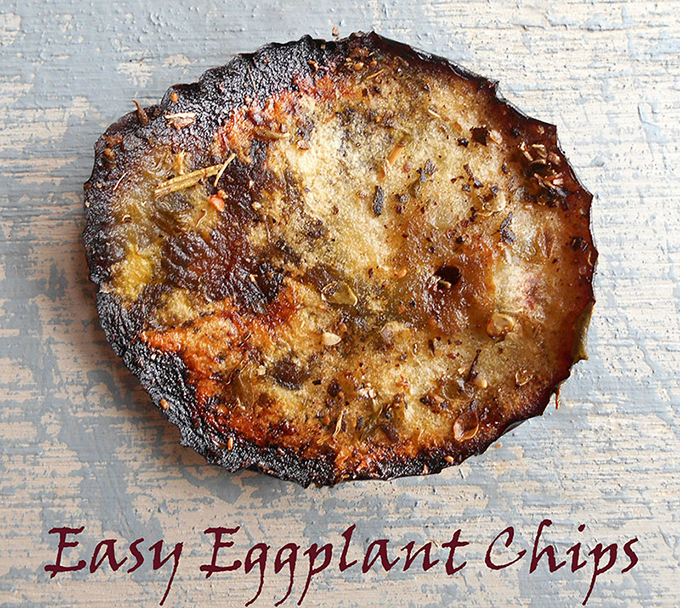 Eggplant chips have become one of my favorite snacks, especially when I experiment with many different spices. I love turning veggies into chips because it makes for a great snack. My favorite is this butternut squash chips and a creamy vegan avocado used as a dipping sauce. I even graduated to other veggies, like Kale chips which are very special becuase I used sriracha in them. Today, I bring you the eggplant chips made with Mediterranean flavors and they are so delicious!! I like noshing them while I am sitting at my desk. Personally, I like my eggplant chips slightly on the burnt side. When served with a salsa recipe (coming soon), it is the perfect comfort food. It is so easy to make because it takes only a few ingredients. Plus, it takes less than 30 minutes to make. This makes sure I don’t have any excuse to eat junk food. I had eggplant left over after my eggplant curry recipe, so, turning it into chips was the perfect way to use it up. I wonder how turnip chips would taste. It will be my next experiment. What is your favorite veggie chip flavor? Do you have to peel eggplant before cooking it? How do you remove the bitterness from eggplant? No, you don’t have to peel the skin from an eggplant. Most recipes will taste better with the skin. 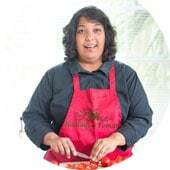 However, some recipes, like “baba ganoush” or “baingan bharta” recipes require the skin to be peeled because you want to work with the “meat” of the eggplant. Salting eggplant is the best way to remove the bitterness from eggplant. Salt helps take away most of bitterness and add a little flavor to the chips. 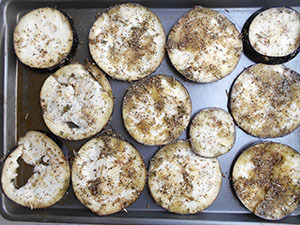 – Cut the eggplant into desired shape (cubed, sliced or strips). 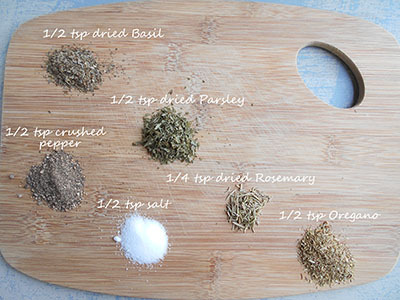 If you are finely dicing them, then you don’t need to salt it. – Place washed eggplants on a paper towel and pat it. 3) Place the salted and dried eggplant in the bowl with the oil and dry spices. You can see how to salt eggplant above in this post. 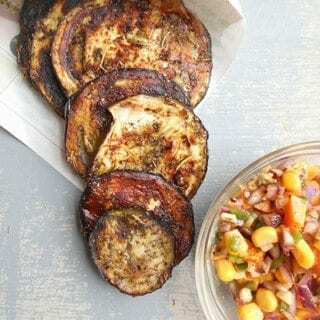 4) Coat the eggplant chips with the oil and spices. Arrange them on a baking tray. 5) Place the tray in the oven. 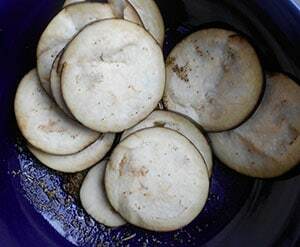 When you see the top browning, you can flip the eggplant chips. Bake for about 15-20 minutes until the chips are evenly browned. Remove from the oven and allow to cool. Serve with ketchup or one of my salsa recipes. The eggplant chips sound so good! Im going to try them tonight. I wonder if you could possibly make your print a lot darker? It would make your delicious food easier to read for us older cook. Thank you, Kathleen. So sorry about that. Thank you for your feedback. I made the text slightly darker and the fonts a little larger. Please let me know how it looks now. This is such a great recipe! It looks absolutely delicious! I can’t wait until mid summer when I have tons of eggplant lying around from the garden. I’m always looking for new ideas for it. I love this! And your pictures make me want to just reach thru the screen! My hubby loves eggplant! I make him eggplant rounds often, but never actual chips. Love all the flavors you used here! Thank you, Vegan8. Let me know what he thinks of Eggplant chips. You know what’s funny is I actually am not an eggplant fan at all, but I make an eggplant fry recipe and I love them like that. So I bet I’d also love them baked in chip form! Something about the flavor and texture just changes when you make them this way. Will have to try! Thank you, Sophia. Eggplants get a bad rap, but, they are actually fun to eat. I am definitely checking out your fried eggplant recipe. I love this idea – it’s brilliant!! 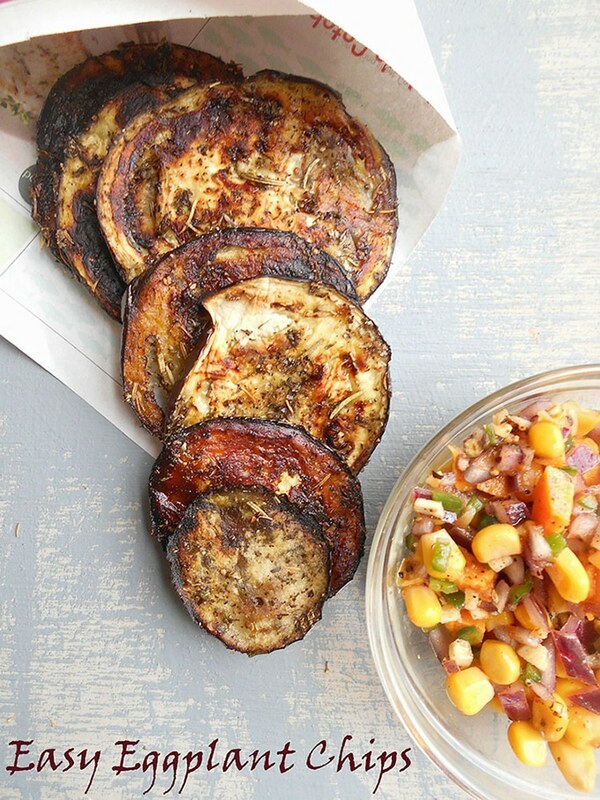 I’ve never tried eggplant chips, but it’s on my to-do list now.